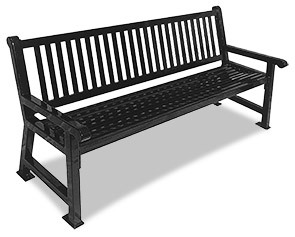 The distinctive slat detail of the 4' or 6' Savannah bench creates an appealing place for visitors to relax and enjoy. The crisp, clean lines presented by the traditional design, allows the charm of this bench to stand out. Engineered for superior permanence, the all steel MIG welded construction is assembled with 2" x 2" square tubing with trusted powder-coat finish that is impact, vandal resistant and UV stabilized that offers ultra-durability against the elements. Available in a popular selection of colors ready to complement indoor or outdoor commercial settings, garden spaces or streetscapes. Maintain a clean and inviting facility aesthetic with a matching 32 gallon slat style trash receptacle from the Savannah Collection.